Africanized honey bees, popularly known as "killer bees," are virtually identical to domestic bees in appearance and toxicity, and they inhabit the same general areas: trees, overhangs, and, on occasion, human homes. However, while a domestic honey bee hive in your yard is a mere nuisance, the extreme aggression of Africanized bees can be deadly. Identifying these bees by their territorial behavior can help you avoid unnecessary confrontation and determine if a hive needs to be relocated or destroyed. Though no more venomous than domestic honey bees, Africanized bees will swarm perceived intruders and sting far more frequently. Locate a honey bee hive; they are typically found inside trees or other hollow spaces. Ensure that you have a safe place to retreat to, such as a car or house with closed windows. Start a significant distance from the hive and walk slowly toward it, making sure to approach from an angle where you will not surprise the bees. Observe the behavior of the bees; domestic honey bees stay close to their hive unless attacked and quickly cease pursuit, but Africanized bees will swarm you like a cloud as you approach and can pursue you for a great distance. Immediately retreat to your safe location if swarming occurs. 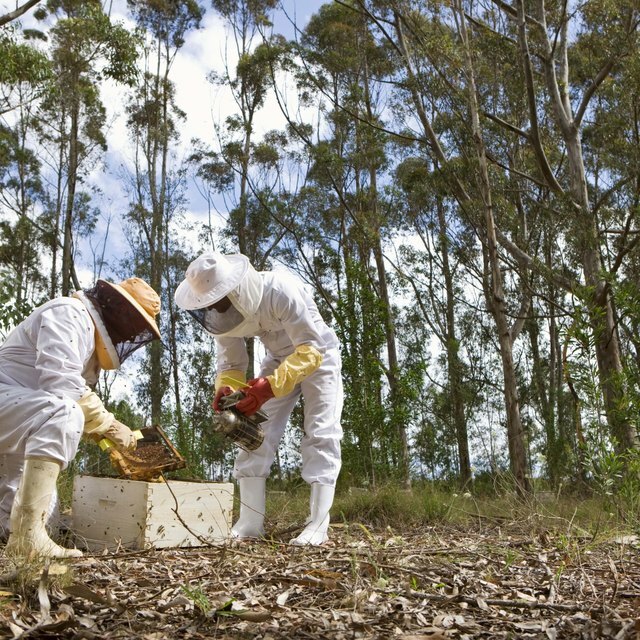 Wear sturdy clothes when approaching a hive, such as jeans and long-sleeved shirts, to reduce the chance of being stung. The Africanized bee is slightly smaller than the domestic honey bee, but this difference is only detectable with precision measurement; don't expect to identify Africanized bees from simple observation. Do not attempt to approach or antagonize any species of bee or wasp if you're allergic to their venom. A single sting can be fatal to an allergic individual. Do not attempt to retreat underwater if you're swarmed by Africanized bees; if the body of water is within their "alert radius," they will remain above the water until you surface, at which point they will continue their attack. Do not attempt to dispose of an Africanized bee hive yourself, especially if it's located inside or near your home; this risks spreading the bees over a larger area and may result in them attacking you. Contact your local animal control for instructions and professional disposal.